A 29-year-old Ketchum woman has been charged with burglary, a felony, for allegedly stealing prescription medicine and cash last week from a home on Fox Acres Road in Hailey. Megan M. Hoyt was formally charged with the crime at an initial court appearance Monday in Blaine County Magistrate Court. 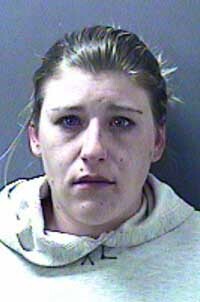 She was released from custody later that day after posting $3,500 bond. A preliminary hearing was scheduled for March 21. Hailey police Lt. Steve England said Hoyt was arrested Friday for allegedly burglarizing the home on Thursday, March 8, and possibly again the following day. "The case is still under investigation with more charges to possibly come," England said. The case against Hoyt arose on March 8 when police received a call shortly before 4 p.m. from the homeowner on Fox Acres Road. England said several types of prescription medication were found missing, as well as an undisclosed amount of cash and other items he declined to discuss because of the continuing investigation. He said the home had been "ransacked" and it was "not a clean burglary," indicating that the burglar was not known by the family. England alleged that Hoyt entered the house again on Friday and was found there by the homeowner, who called police at 2:40 p.m.
"The resident had come home and found Megan Hoyt in her bedroom, and there were other items missing," England said. "She [Hoyt] left before we got there. She left in her vehicle." England said police were able to identify Hoyt by the resident's description of her and her vehicle. Hoyt was arrested later that day at her place of employment on West Croy Street in Hailey. England said the case is somewhat unusual because the burglary occurred in "broad daylight." He said the thief entered the home through an unlocked door.